Lowercase L errors are usually ephemeral, written on cardboard, scribbled on scrap paper, or arranged with letter tiles on a roadside readerboard. But once in a great while, a lowercase L makes a mark of permanence in the world, and it simply cannot be ignored. 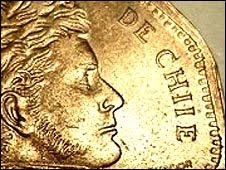 Such is the case with the flawed 50-peso coins minted in Chile in 2008. Surprisingly, no one noticed the misspelled CHIlE until just a few weeks ago. Are people so used to writing lowercase L's among all uppercase letters that everyone thought this was passable? This could be a result of mistaking the uppercase i stamp for an L stamp, or the error could have followed a poorly handwritten note that instructed the Chilean minter to cast the letters CHIlE in metal. Or perhaps there was a conspiracy to inject the market for erroneous coins with fresh material. Either way, this may be bigger than the Manhattan Project incident. Thanks to Adrian Bailey for passing along this news! My, my. That's the biggest find yet.